I’ve known for a long time now that I’m actually part chameleon. It’s true. 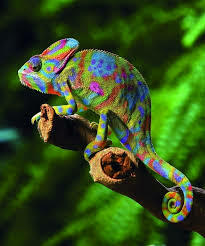 The chameleon is my “lame animal totem”. A lame animal totem is the humbling (yet hilarious) way Martha Beck uses to explain our worst tendencies. Feel like doing absolutely nothing, making no decisions, and eating a whole lot of whatever? That’s probably your inner blobfish coming out. Are you obsessively fixated on something, trying repeatedly to do something that will never work until it finally drowns you? That’s probably your inner lemming shining through. You need to learn about these totems to learn about yourself, but also for the pure joy of knowing there are creatures on this planet named the Oak Titmouse (a bird) and Dog Vomit Slime Mold (a fungus). Awesome, isn’t it? Martha has yet to single out my chameleon as a lame totem, but I’m sure its day will come. My chameleon has been with me for as long as I can remember. It gives me the super-power to adapt to practically any situation. This is very dangerous for a people-pleaser who has a desperate need for everyone to like her. You need me to be the smartest in the class? Great! I’ll sit up front and scribble notes furiously and study all night! You want me to hang out at your party? Cool! I’ll pretend that I love staying up late, I don’t care about my curfew or the fact that I have to work tomorrow, and that I actually like the taste of beer! You want to talk sports? Awesome. I’ll start a fantasy football team, watch Sports Center on ESPN, and read about the latest player scandal so I’ll sound like an expert! I was dancing on the fine line between being a fake and genuinely enjoying what I was learning about all the different people and activities along the way. The chameleon finally freaked me out at my thirtieth birthday party. At this point in my life, I had accumulated friends from many circles. I thought it would be so awesome if they were all in one place at the same time. The people I loved from college could meet the people I loved from work! The friends I had so much fun with at concerts could meet the friends I enjoyed discussing books with. Turns out my chameleon wasn’t ready to handle all that at once. These people all knew a different side of me and didn’t actually have that much in common with each other. I was bouncing from group to group, changing my personality rapidly as I went. My people-pleasing went into overdrive. I think I actually started twitching before it was all over. Good thing I didn’t throw any family into the mix, or I might have spontaneously combusted. Don’t get me wrong, the chameleon has served me well for many years. I hold no grudges against it. It taught me how to adapt and change. It taught me how to pay close attention to what other people need and want. Not always for the best purposes, but it’s a great skill nonetheless. One that helped me become a great employee, which opened many doors for me. One that helped me appreciate all walks of life and notice all types of people. One that has brought me so many genuine friendships with all sorts of interesting people. In order to overcome this obstacle, I was determined to understand its purpose. It’s one thing for me to tame this chameleon for the sake of others. Or to make myself feel better about my motives. But why do I have this gift in the first place? I don’t think God gives us anything without a good purpose. Everything we have is a gift from Him, to be used for good – even our personalities. From there it is our free will to decide how to use those gifts – for our purpose, or for His? 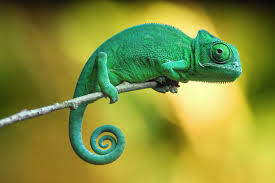 So I started wondering what it might look like to use this chameleon for God. Instead of conforming to whatever is in front of me, stop and listen. Analyze. Use the chameleon power to become not what that person thinks they need, not what I think that person needs, but what God needs me to be when He needs it. And only for what He needs…then step aside and give the control back to God. I started practicing this on social media. I was faced with someone’s nasty rant. Shocking, I know. I could change my skin to join the rant, and make sure the person sees me totally agree with them so they can feel validated. Or I could change to my preacher skin, and really teach that person what I perceive to be a good Christian lesson! But this time, I paused. I prayed and asked God what He thought this person needed from me right now, if anything. I waited for instruction from God. And then it came to me. Agreeing with them wouldn’t be true and would fuel the negative fire. Lecturing them would make them feel judged and shut me (and God) out. What this person needed in that moment was to feel hope and love. So instead, I shared a word of encouragement, and I told the person that I loved them. And you know what? It stopped the steady stream of negativity. It didn’t make them a brand new person with a completely different outlook on life right then and there. But hopefully it planted a seed. And I can keep being an example to this person in God’s time, whenever and however it is needed. This was way better than anything I have ever accomplished before with my chameleon gift. And it was so small! Imagine what the chameleon might be capable of if I keep practicing and listening for God’s instruction in bigger situations!